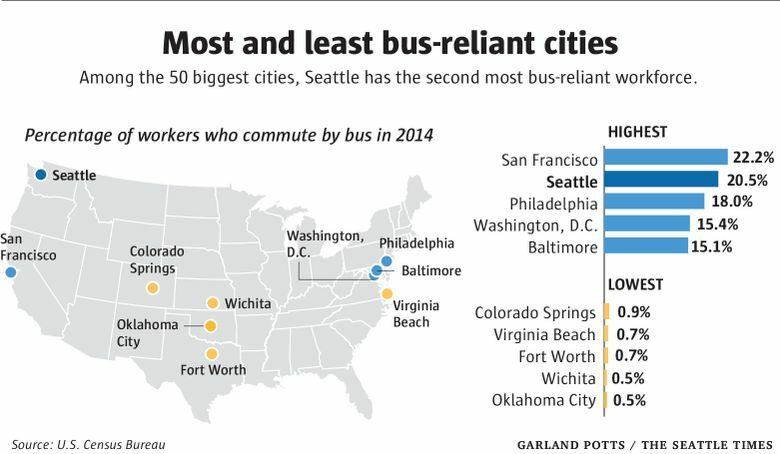 Seattle is now the second most bus-reliant metropolis, after San Francisco. It’s how one out of five of us — that’s 78,000 Seattleites — get to our jobs, according to FYI Guy's analysis of census data. A lot of folks have accused City Hall of waging a “war on cars.” Well, it looks like — whether a casualty of battle or just changing habits — cars are losing. Between 2010 and 2014, Seattle experienced the biggest jump in bus ridership of any major U.S. city, according to my analysis of census data. 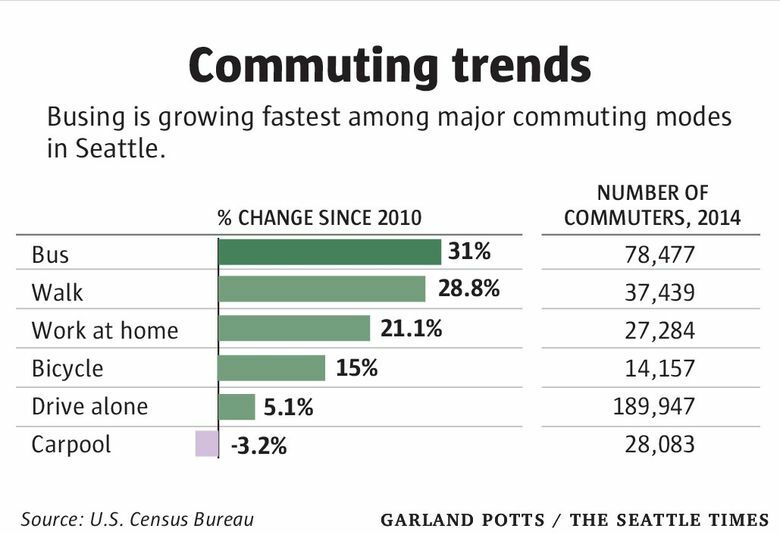 In this period, Seattle’s workforce population grew by about 44,000 — and nearly 19,000 of those folks are commuting by bus. That’s 42 percent of the total increase. And that 19,000-person bump handily beat out No. 2 Chicago’s gain by more than 4,000 riders. With that surge in ridership, Seattle now ranks as the second most bus-reliant major U.S. city, after San Francisco. 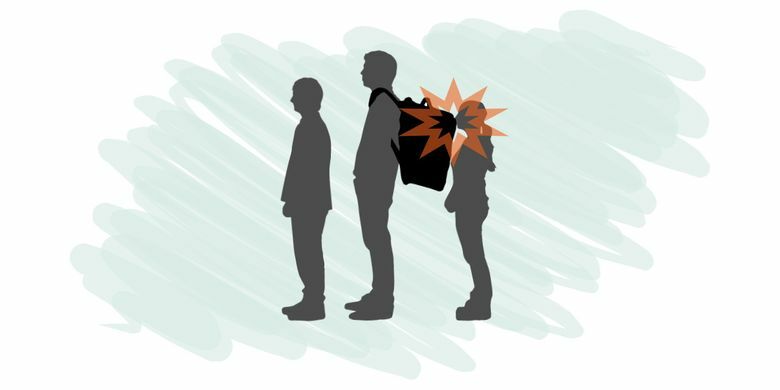 It’s how one out of five of us — that’s 78,000 Seattleites — get to our jobs. This doesn’t even count the increase of 3,000 folks getting to work by other forms of mass transit — light rail or trolley or ferry. Driving alone to work, meanwhile, seems to be losing steam in Seattle. The number of solo car commuters increased by just 9,000 in this period — less than half the ridership gains made by the bus. 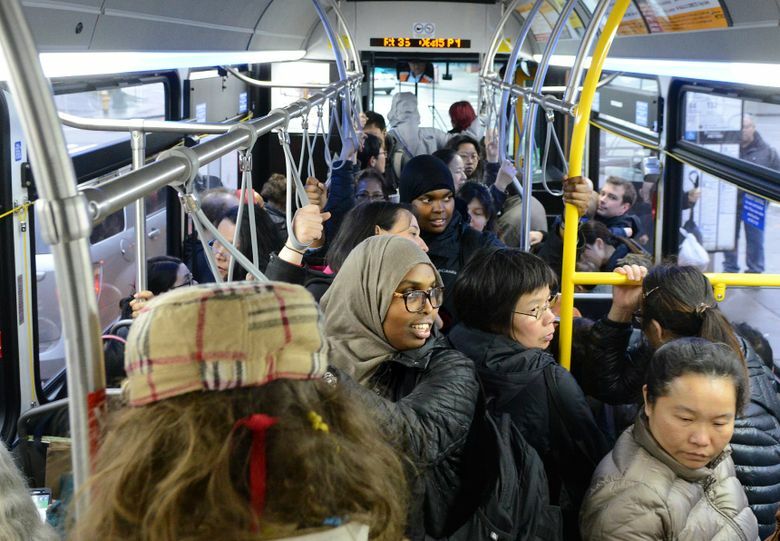 Clearly, newcomers to our city are overwhelmingly choosing to bus it to work. Additionally, the data suggest that longtime residents are switching over from their cars. It isn’t that most of these folks have no other choice. According to surveys conducted by King County Metro, about 90 percent of its riders have access to a vehicle. Rather, people are busing because they’ve concluded it’s a better option than driving. It doesn’t take a rocket scientist (or transportation engineer) to figure out why — and it has nothing to do with the so-called war on cars. No, the cost of parking and the misery of driving in Seattle’s stop-and-go traffic is surely behind the surge in bus ridership. In this fast-growing region, our road network is being stretched beyond its capacity. And most people still do drive alone to work — 65 percent countywide, according to the census. So it’s no wonder that our traffic is consistently placed among the worst in the nation. The most recent report, from the TomTom navigation company, ranked Seattle’s evening rush hour as the second worst among American cities, behind Los Angeles. But you don’t need any ranking to tell you that — one slow crawl on I-5 is proof enough. Meanwhile, bus commuting increased in two out of three census tracts in Seattle between 2010 and 2014. In several neighborhoods, it more than doubled: Greenwood, Crown Hill and the Meadowbrook area of Lake City. Still, the most bus-dependent place in Seattle is the Chinatown/International District — it’s how half of all workers who live in the neighborhood get to their jobs. While no other neighborhood comes close, there are a few where about one in three workers take the bus: Capitol Hill, the University District and Fremont. It’s not just an urban thing, either. 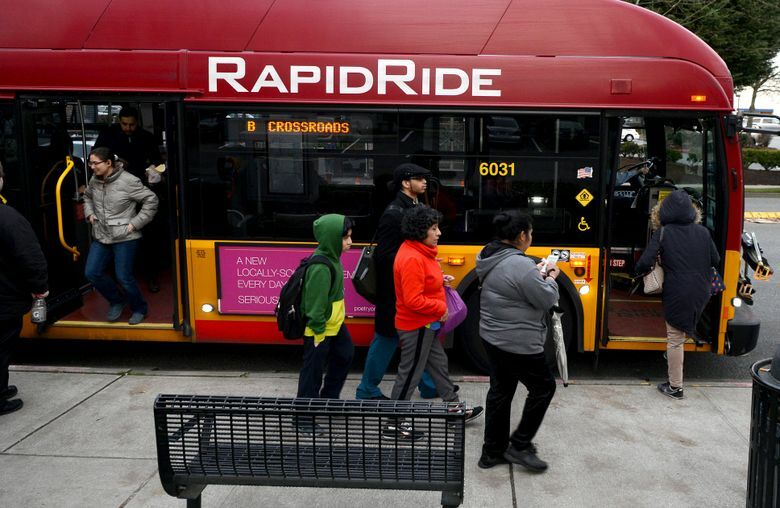 Although ridership is generally lower in the suburbs — about 60,000 commute by bus in King County outside Seattle — the numbers are growing at an even faster clip than in the city. In fact, the neighborhood with the biggest jump in bus commuting since 2010 is in the suburbs. Can you guess where it is? In this brief period, its share of residents who commute by bus jumped from 12 percent to 28 percent. Answer: the Crossroads section of Bellevue.